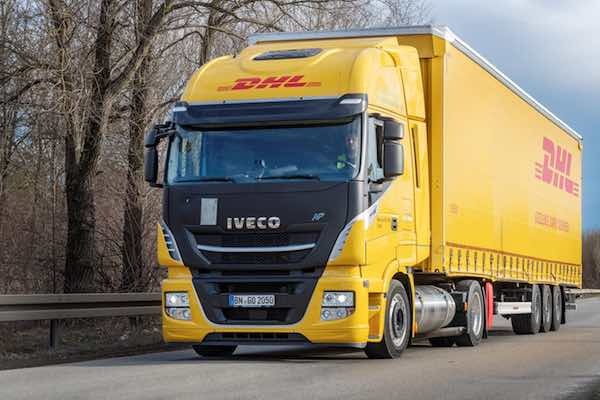 DHL Freight, one of the leading providers of road freight services in Europe, has deployed one of the very first liquefied natural gas (LNG)-powered Iveco Stralis long-haul trucks capable of towing a mega trailer. During a year-long trial period the truck will operate as a daily shuttle between DHL’s logistics center and a BMW Group production plant in southern Germany. 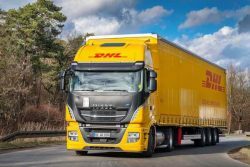 Based on Deutsche Post DHL Group’s target to reduce all logistics-related emissions to net zero by 2050, DHL Freight is increasingly investing in alternative drives for short- and long-distance transportation. LNG-fueled trucks offer 15% higher fuel efficiency compared to traditional diesel-powered engines and have a reach of 1500 kilometers. This represents an immediate cost saving. They also emit 99% less particulate matter and up to 70% less nitrogen oxide (NOx) emissions than the levels required by the current Euro VI diesel norms. The greatly reduced noise levels emitted by the LNG-powered engines provide an additional benefit when travel includes inner-city areas and around-the-clock transportation.